Begs the question why do LCC only descope the postcodes once B4RN has covered the area? This effectively stops any support going to that area from bduk funding. The same thing has happened in Abbeystead and Arkholme. If this is ‘big society’ in action it doesn’t have a lot going for it. One reads all these press releases from BT about their chaps struggling away in all weathers to unblock ducts, and fix wonky poles in order to bring us fibre. But surely they’re using public subsidy to belatedly carry out routine maintenance that hasn’t been carried out for years because the money has been diverted to shareholders. This is true, BDUK is paying for duct clearing, new ducts.. Also it is paying for the expansion of the OR countrywide backbone fibre infrastructure which capacity from is sold for a pretty penny . Does DCMS think the fund is just going to be used to run enough fibre to light up cabinets? . It seems the situation might be a little more complicated than suggested above. Thanks for following BrokenTelephone, Mark. I read your story. No, it’s not more complicated, or if it is, your story doesn’t show it. It is in the sense that LCC seem to have some caveats in the postcodes they notified to B4RN, which B4RN has rightly rejected as final until they can get a clear commitment. Otherwise there’s still some risk of public money being used with BT in Dolphinholme and that needs to be clarified. Actually, it just means that BT switches the pocket from which it pays for the work. But having said previously Dolphinholme is in an uneconomic area for it, why would it build there at all. Which is the point Barry Forde makes. However, the village does lie on a route to a mobile base station. 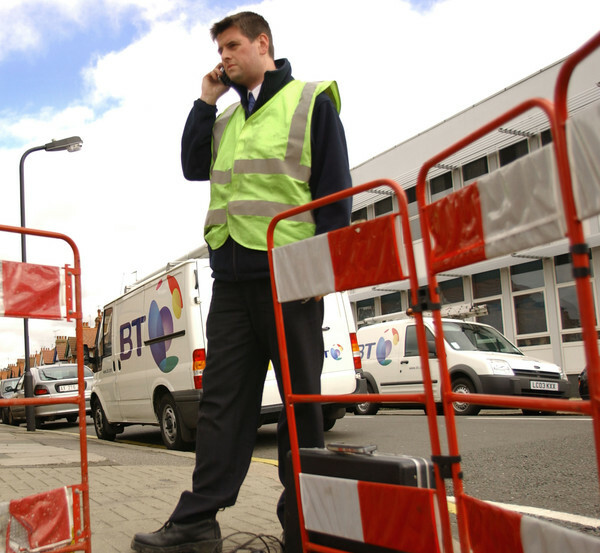 One expects BT to lay fibre to the mast on commercial terms for the mobile operators. The cost of providing the villagers with access to spare fibres would be marginal. BT can’t simply use spare fibres to deploy in Dolphinholme. They have to deploy the FTTP in its own separate microducts. The biggest cost of the deployment is getting the fibre to each individual property, hence the use of FTTC and it costing a fraction of FTTP. A mobile mast nearby won’t do much to reduce this. Not speaking about Dolphinholme, because it has access to B4RN’s fibre, but what if that mobile mast carried two or three mobile operators, each supplying 1Gbps dowloads via LTE-A…? True, it’s not synchronous, but it might do for residents. Openreach have lots of areas that are commercially viable and lots more that are not.. the public funding is meant to be for the latter.. Where this skews however is when there is a competitor in the latter in my view. It appears OR have a blank cheque as far as what they tell the local authorities as to where is or is not commercially viable. So lets say area A is commercially viable but has no competitors outside the OR model. Area B isn’t commercially viable and has competitor(s). What is there to prevent OR stating that area A isn’t commercially viable and therefore can be funded by BDUK and Area B is viable and therefore will be done commercially. This prevents backlash from “over build” accusations using public funds , it means OR get the money regardless and the Local Auth gets to say how well it has done without risking legal action from other providers. Stopping BDUK funds for Dolphinholme is not going to deprive OR of those funds.. they will spend them somewhere else instead and “commercially” build out Dolphinholme. of course.. there maybe no truth in this at all…. YMMV ..
talking of Pocket switched… OR had flatly refused to provide ADSL to the Sutton area of West Sussex despite a lot of pro BT effort by various bodies over the last decade or so.. Now it seems it is viable to do Fibre there , even though a long term commercial FWA operator is present and serving the community..
Bill – it is BTWholesale not Openreach that do or do not provide ADSL. and going back historically it was a FWA operator that SEEDA (the RDA at the time) awarded the contract to supply broadband to Sutton area. As for fibre it would be the local authority under BDUK contract that decides where they want to spend the fibre money, as the area is still not viable on its own. interesting.. There i was thinking that Sutton area was provided Broadband via a commercial company without any public funding or input from SEEDA whatsoever ? In fact within my memory of events SEEDA refused to talk or respond to the FWA operator in question , despite many attempts to engage with them. The District council, via its head of economic development, did their best to try and squash the FWA operator once the service was live by promoting an alternative Wifi Mesh option to the residents only a few weeks after the FWA service was announced. The mesh thing of course was to be financed by the council , it never materialised but the company involved kept promising the would for some 6 months or so. BTwholesale may provide ADSL but Openreach define the viability of providing the infrastructure to support it surely? What other reason would there be for not putting a DSLAM into that exchange if it wasn’t the economics of OR providing the feed to the exchange? Or are you saying that they have kept this exchange ADSL dark for ~ 14 years without a genuine reason? I would of course be interested to know more about this SEEDA contract you speak of? Actually it’s almost certainly Openreach that decide where they want to spend the money. In most agreements Openreach agree a coverage target and decide themselves where they’ll deploy to achieve it. So is there superfast broadband in Lower Dolphphinholme now? And if so, who are the providers? A year later and there is still no superfast in Dolphinholme, but BT are still digging streets up. Hyperfast B4RN is in Lower Dolphinholme as well as Higher though. The people dug it in themselves. A gigabit symmetrical for £30 a month. who wants “up to” super fast when hyper fast is there tho? . Join B4RN’s network, bin the BT line , go VoIP and £30 a month is a bargain! . Especially as BT are increasing line rental to 17.99 soon and call charges too. VoIP call charges are a tenth of the cost (entirely free to other VoIP users) and no line rental. We use and recommend http://www.voipfone.co.uk here.